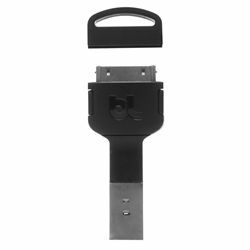 Designed to charge your iPhone or iPad from your Mac laptop (or any laptop that has a flat bottom and horizontal USB ports), the Kii is a charge connector that can fit on your key chain to be with you wherever you go. Just release the cap and plug it in! It's the shortest charge cord because it has no cord! Its lightweight and inconspicuous design blends in with your regular keys, allowing you to charge or sync devices from any computer without having to carry a charger or tote around a cable connector. The perfect travel companion is always on your key chain. The 30-pin connector works with iPhone 4S, iPhone 4, iPhone 3GS, iPhone 3G, iPhone, iPad (3rd generation), iPad 2, iPad, iPod touch (1st through 4th generation), iPod classic, and iPod nano (1st through 6th generation).